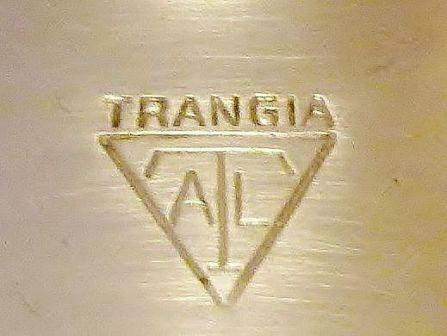 Vintage Trangias from the 1950s were the first generation of camp stoves Trangia produced. 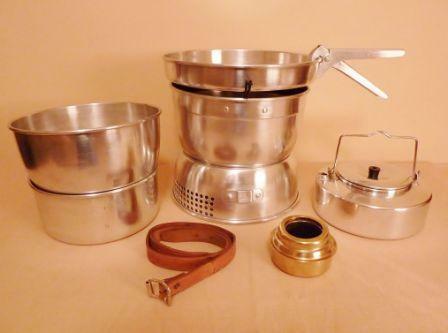 It was in 1951 when Trangia manufactured the first model 25 camp stove, these early 1950s Trangia stoves are very rare indeed, very occasionally one might pop up on an auction site, but they are few and far between. 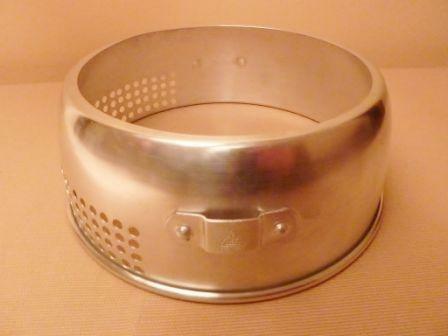 During the end of the 1950s Trangia started manufacturing the model 27 camp stove. For the purpose of this article, we will be taking a closer look at an early 1950s model 25. 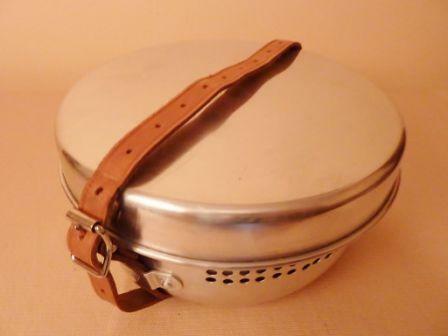 The photo above shows a fine example of an early 1950s Trangia model 25, although the general design looks the same as the present day versions, there are quite a few differences, one very noticeable difference that doesn't show in the photo is the weight and thickness of the aluminium, vintage Trangias seem to be made of a much heavier grade of aluminium than later versions. Note; Trangia straps can be useful for dating Trangias, I will discuss this in more detail in another section of this website. One of the design features I really like with vintage Trangias are the riveted strap retainers, they seem so much more robust than the pressed out versions found on later Trangias, but that's just my personal choice, some people prefer the newer pressed style because its lighter and more streamlined. 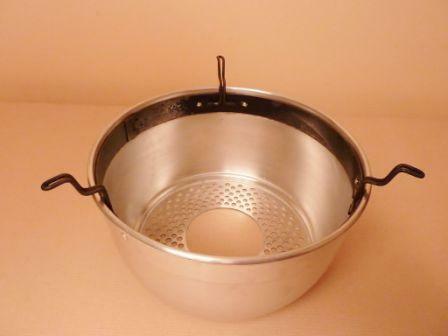 The upper windshield has a black coated metal band that contains the folding pot supports, this design changed during the 1970s to stainless steel with better designed folding pot supports. also, note the burner housing at the base of the upper windshield. 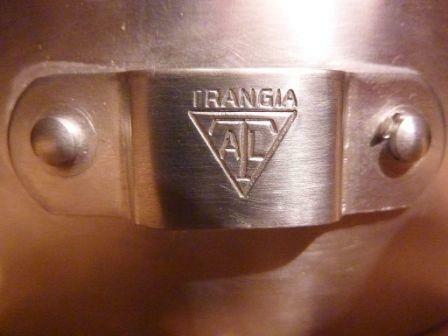 There are various differences between vintage and modern Trangia kettles. Starting with the handle, the first thing you will notice is the different shape with no plastic coating, although I have seen plastic coating used on the same 1950s style kettles, it appears that early 1950s kettles missed out on this treatment. 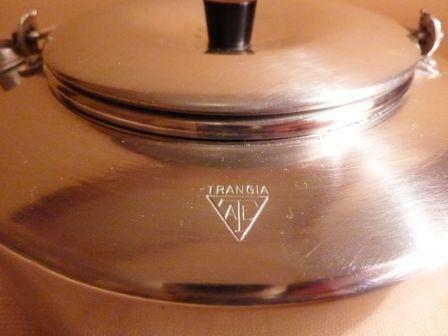 1950s kettles have the Trangia logo stamped on the top of the kettle, later models have the logo stamped on the lid. 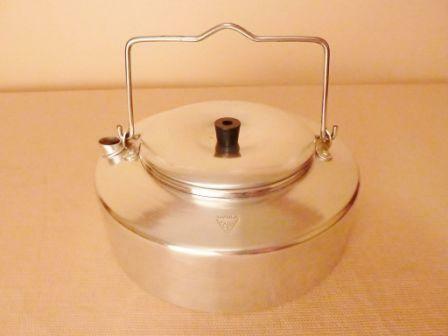 Other obvious differences that the 1950s kettle has are, smaller lid handle (first style lid handles were D-rings), smaller diameter lid, and smaller spout, the kettle has the same overall diameter as its modern counterpart, but has a lower profile. 1950s Trangia Bass Spirit Burner. Early 1950s Trangia spirit burners differ considerably from the modern style Trangia burner that we all know and love. The first question you're probably asking is... Ok where has the lid gone ?... Well, obviously Trangia thought they would deprive us of such luxuries, ( just kidding ). Although the burner has no lid, it does have a hinged simmer ring, its not designed to extinguish the flame, only reduce it for slow cooking. 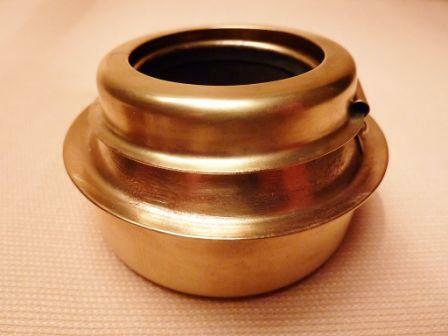 If like me, you like to store and carry fuel inside the burner then maybe a 1950s style burner isn't going to be of much use, but all things considered, these are collectors items that you probably wouldn't want to use anyway. Interestingly, the burner has 2 rows of holes/jets, there are 18 on the bottom and 18 on the top, modern burners have 1 row of 24. 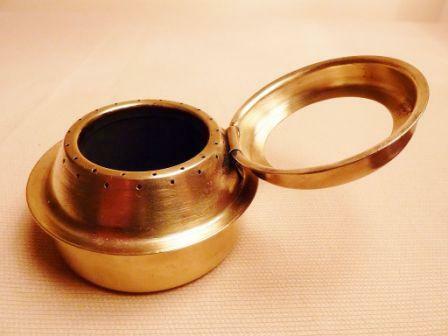 The burner has the same diameter as a modern version and can be interchanged with different windshields. 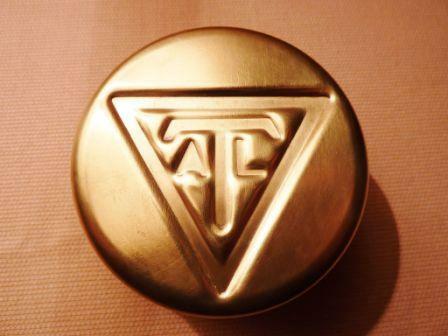 The underside of the spirit burner has the unmistakeable 1950s style Trangia logo. 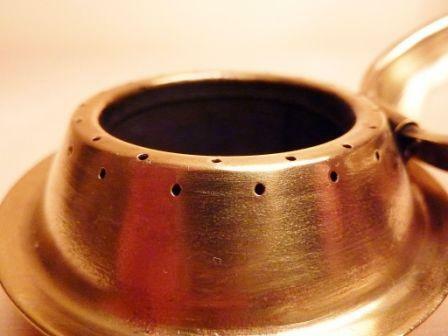 As with all Trangia spirit burners the 1950s version is made from solid brass. 1950s Trangia Pan Grips & Saucepan. 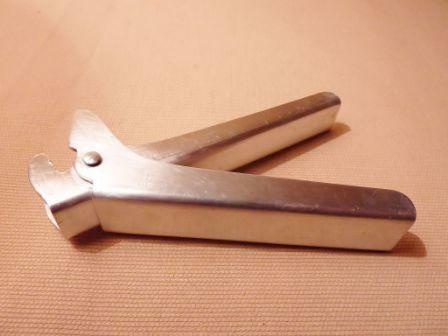 A few other differences worth mentioning are, the pan grips on vintage Trangias don't have holes cut in them, pan grips with holes appeared during the 1970s. 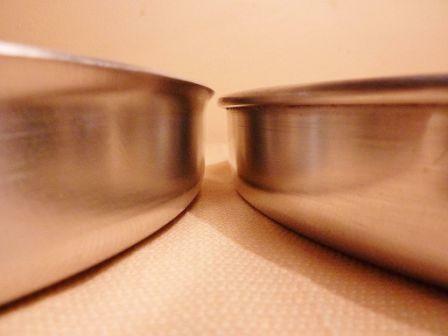 1950s Trangia frying pans had a rolled top edge as opposed to the curled lip seen on the later frying pans, also you'll notice in the photo the 1950s frying pan (on the right) is a fraction shorter than the later version. 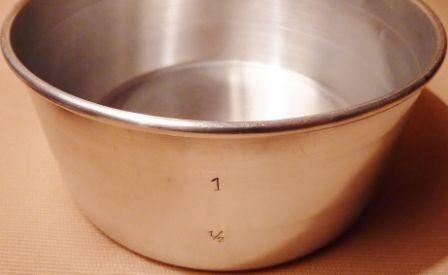 Another small design change can be seen on the small saucepan, the style of the litre graduations are different. Vintage Trangias can be quite difficult to date accurately, often the nearest decade is all that's possible. If you have any information regarding 1950s vintage Trangias, or would like to send a photo or comment of yours, please use the comment section below, I look forward to your contribution. Have Any information About This Topic?